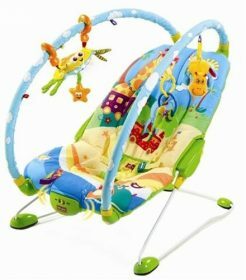 Adjustable arches can be widened or gathered as possible as you can.This is more helpful for parents to put the baby in and close for baby to catch the toys hanging on the arches.There is a safety belt on the seat to protect your baby. By touching the dangling star, the baby will be very joyful for the music and lights from the toy he has touched. This portability bouncer allows you to take it from one room to any other room at any time. 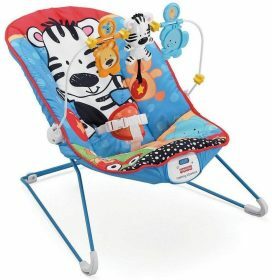 Fisher-Price Adorable Animals Baby’s Bouncer is a very special one which bring your baby to the zoo. What Mom should do is parking your baby on the comfortable chair. Then, you can do anything you want to do and put the bouncer wherever you are. You needn’t spend time amusing him or her because the zoo provides him or her a cheerful environment. 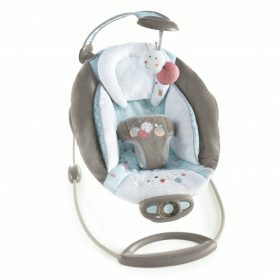 Kicking the elephant and lion paddles and a smiling zebra makes the baby delightful.When your baby is tired, remove the toy bar and switch on calming vibrations. Ingenuity Automatic Bouncer can give your baby a feeling of security. He will have the impression that in the arms of mom and be very calm. When you do housework, your baby can appreciate pleasant melodies and music. There are some buttons on it: power, volume, music, and bounce.The automatic bounce function (last 30 minutes) is used to cradle the baby sleep easily. 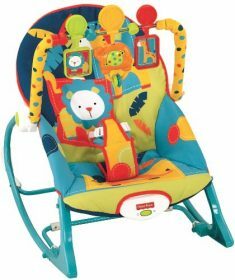 Fisher-Price Infant To Toddler Rocker suits the baby from newborn to toddler.It’s really worth buying.It has toys hanging on the arches which are very colorful and attract baby to catch them and play with them.At the same time, it offers the baby merry sounds. 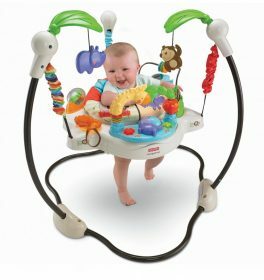 Additionally, with the growth of your baby, you have to adjust the height of the bouncer to meet your baby’s need. When your baby is tied, you just press the button to start to bounce and then come back to your affairs.What’ s more, the soft baby cushion can remove and be washed by machine.